A speaker or culture can create distrust for any number of reasons. A leader tells outright lies, distorts the truth, covers up problems and information. He or she may blame others for failures, refusing to accept personal responsibility for mistakes and weaknesses. And then there’s the problem of inconsistency—in actions, decisions, directions, rewards. On Monday, the goal is X; on Thursday, the goal is Y. People have different standards for rewards. Worse are the moral lapses—what he says doesn’t match what he does. Incompetence completes the downhill slide. So what to do to build trust? Tell the truth. Communicate your reasoning to those you lead. Be approachable. Demonstrate competence. Be hopeful, positive, and confident about the future. Communicate consistently and repeatedly. And make sure your body language underscores trust. Leaders fail when all the communication is one-directional. Leaders succeed when they create a culture of shared values and goals and collaborate on changes and outcomes. Leaders fail when they use language to try to impress, to leave loopholes for themselves, and to avoid accountability. More successful leaders cut through the complexity that obscures ideas and priorities and instead use clear language that drives action. Careless, insensitive, “hot” words offend and sidetrack people from hearing the primary message and accomplishing key goals. Persuasive leaders use precise, powerful, yet tactful phrasing. Less successful leaders underestimate the importance of positioning ideas they present to others; they downplay the importance of phrasing, time, delivery and structure of what they communicate. Successful leaders become students of language and learn to communicate important messages with maximum appeal. 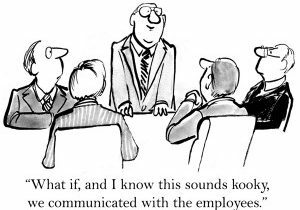 Leaders fail when their communication provides so much information that it overwhelms people. Great leaders cut through the clutter; they understand that more is not better, but instead often weakens impact. Generic information does not make a strong impression and is easily forgotten. Strong leaders make their communication meaningful and memorable: specific, relevant, interpreted, and structured to fit the audience, situation, and purpose. Logical explanations inform—but rarely motivate. Leaders who think otherwise fail. An emotional appeal persuades. Leaders who speak to both the head and the heart succeed more often than those who take only a “logical,” one-prong approach. Leaders who listen only to what is said miss far too much of the “conversation.” More successful leaders practice empathy, use silence, understand different points of view and cultures, and read between the lines about what’s not said to reveal the real message and produce the best outcome. Powerful, persuasive communication leads to success—personal success, career success and organisational success. Communication cultures are created, not wished into existence. Great communicators model the masters, practise the strategies and measure the results. Is your communication style failing?